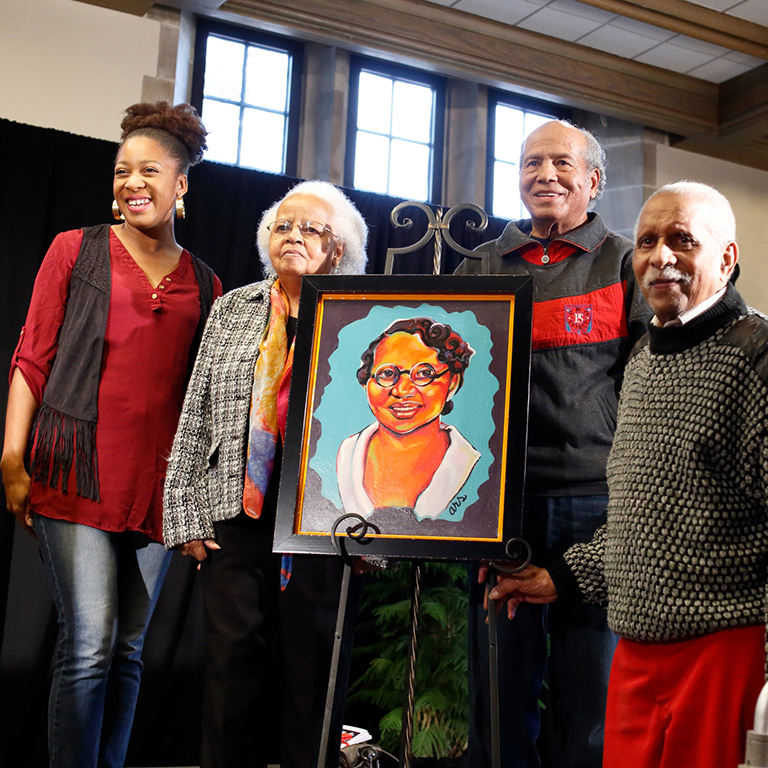 Alumni, faculty, staff and students gathered in the East Lounge of the Indiana Memorial Union on March 27, waiting for the unveiling of the highly anticipated portrait of Carrie Parker Taylor, the first female African-American to attend IU. But perhaps the most excited were members of the Taylor family, who filled up nearly two rows of chairs in the front of the room. Joining in on the celebration was Taylor's youngest son, 100-year-old Leon Taylor, as well as several of her grandchildren and great-grandchildren. IU first lady Laurie Burns McRobbie spoke about IU's history and the stories of the individuals who comprise it, as Taylor's portrait was unveiled as part of the "Women of Indiana University" art exhibit. "These paintings are a way to bring their contributions to life, and, as their eyes look out at us, we are invited into their stories," McRobbie said. "Carrie Parker Taylor's portrait will provide us a window into history and what it meant for an African-American woman to pursue higher education over 100 years ago." When IU Archives director Dina Kellams happened upon Taylor's name in a brief newspaper story nearly two years ago, all that was really known about IU's first African-American female student was just that, her name. Over the course of a few months, Kellams continued her research, which eventually led to finding Taylor's family. Since then, the family has made the trip to Indiana several times to walk the campus their mother and grandmother did so many years ago, and the university created the Carrie Parker Taylor Scholarship to honor her legacy, which was awarded to the inaugural recipients in May 2016. Now, as another way to celebrate her legacy, Taylor's portrait will hang next to the portraits of other influential women who helped shape IU, such as Elinor Ostrom, Nellie Showers Teter and others. When the painting was unveiled, there was immediate applause and murmurs of, "it's beautiful" from the crowd, but one of Taylor's granddaughters summed up the painting's beauty. "It has granny's smile," Carolyn Taylor Outlaw said. Ashley Smith, the artist commissioned to paint the portrait, is from Elkhart, Indiana, and is in her first year of grad school in IU's School of Informatics and Computing. As an undergraduate, she studied fine arts, psychology and African Diaspora studies at IU. Smith said she immediately connected to Taylor's story, as she grew up just an hour from Clinton, Indiana, which was Taylor's first home in the state, and Smith was the first in her family to graduate college. "As an artist, having the opportunity to do something like this is special," Smith said. "And as an African-American, I didn't take this task lightly." "Her ambition is part of the reason why I'm here at IU today. Someone had to be the first, and it's not easy to be the first to do anything. But because of that, she's made it easier for me to be here, so many years later," she said. That ambition is what she wanted to convey most through the painting, because that's what stood out to her about Taylor's story. And, to the Taylor family, their mother and grandmother's ambition and dedication to education are what made her such a special woman. "My grandmother was a great woman," Outlaw said. "And she instilled that in her children and grandchildren. There's a whole bunch of stubborn, hard-headed, bound-to-do-it women in this family." Although the Taylor family were all well aware of her achievements and her legacy, Leon Taylor, who will turn 101 next month, conveyed his thoughts on having his mother recognized by the university in a way that will allow her legacy to live on permanently. "It's very nice, and it looks just like her," he said. "It's so nice to have her honored after all these years."